My grandma, she quilts. She has a whole room for quilting. Her embroidery machine is so crazy that it has it's own operating system. Seriously, it runs Microsoft Windows. So, I'm like, Hey, I'm a lot like my grandma, let's make a quilt. So I did. Obviously. 'Cause I try to be the kind of person who follows through on what they say. It was... kind of evil. 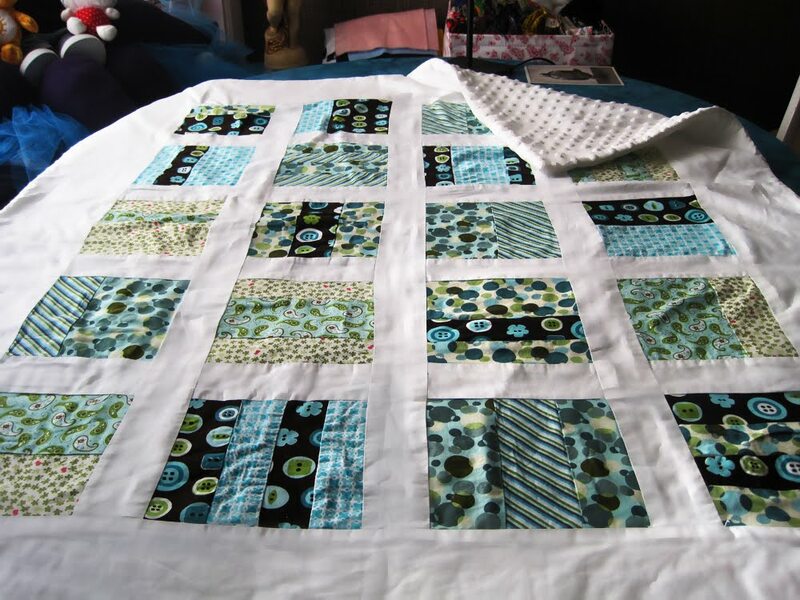 Being generally pretty fabulous, I love the materials I picked out, and the general layout of the quilt. The white fabric was a bad choice and is just way too wrinkly. I had a ton of fun sewing together the little squares, but putting them together into one big quilt was a pain and no fun at all. Of course, after I was finished, my grandma decided to let me in on the secret that I could fully quilt the small squares, and then put the whole thing together after. Which she totally does herself. Thanks, Grandma. ...the quilt was a gift for Peanut! I love you, Peanut~! Look how cute he is. Who cares that he already has like fifteen blankets that other people made for him? People who actually know what they're doing, no less. Besides the poo quality, this blanket is clearly the best thing he owns. And it's extra special because it is the only quilt I will ever make ever. Screw quilting. Today I have a guest post featured on Ramblings of a Singleton! You can read the story of my first love here. Oh my god, it looks so nice! I love it! Quilting is really hard. I like mini-quilting projects, like with my pincushions, but bigggg quilts? That'd be hard! I'm stuck on fat quarters. Yeah, even this baby quilt was a pain. Small-scale quilting is fun. The crazy-quilted Christmas stockings I made were really fun. In fact, I'm gonna make more this year.